Showering and taking care of your “business” are the parts of van life that nobody likes to think about. Unfortunately, to many people, van dwellers are seen as hippies with B.O. Maybe this is what you’re going for, but if not, you’re in luck. There are numerous easy, affordable ways to keep up with your hygiene while living in a van off the grid. One of the biggest questions you will be asked when people first learn that your van is your home is, “How do you shower?” Camper van showering may be one of the most challenging obstacles you may face when first making the move into a van, but after some time you’ll find it’s not hard at all. With a little bit of adjustment, and maybe a little creativity, you can keep that personal hygiene up, and stay squeaky clean. Depending on your lifestyle, a daily shower isn’t always necessary. Our friend Alex (@vantravelphoto) has the benefit of spending most of his time near the ocean, taking regular dips and or surfing helps keep fresh in between regular showers. And of course, at the beach there’s always outdoor public showers to rinse off at. If you don’t live by, or are close to a beach, you should go there! Isn’t that why we live in a van? In between showers, he became a big fan of baby wipes. A friend who is a forest firefighter in California turned him on to this trick. They spend sometimes weeks in the forest battling the flames. Living in a van, you may not always have the luxury of long, hot, showers but we all know the tradeoff is well worth it. In this section, we will explore some of the different ways to stay clean. Feel free to try them all and see what works best for you. With these portable shower options, you’re not going to have the luxury of an instantly hot shower. What you can do is boil some water to mix in with the water used for your shower to make it a more suitable temperature. 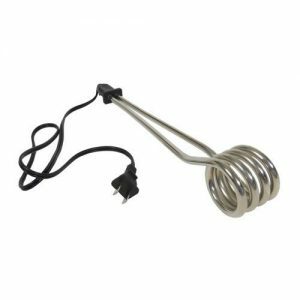 Or you can buy a hot coil element to place in the water as well – we talk about this in the shower accessories section near the bottom of the page. 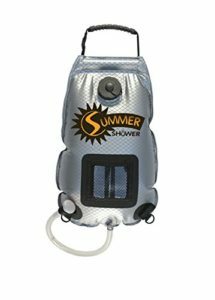 We’ve heard really great things about this portable shower being perfect for van life. It requires just a few hand pumps to get the water flowing for nearly the whole container. If you paint the outside black and set it out in the sun, this will warm the water up – just make sure you leave a vertical strip unpainted so you can see how much water is left in the container. The downside to this shower is it doesn’t collapse to provide for easy storage when not in use. Hook it up to your sink or you can put the opposite end of the unit into a bucket of water and it will pump the water through to the shower head. 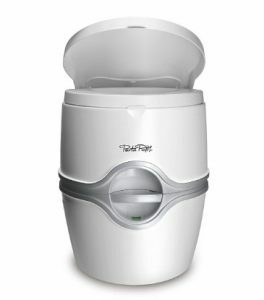 What’s amazing about this option is it comes with a filtration device to ensure your water is fresh. The battery is easily rechargeable and lasts up to 1 hour of continuous use. This option is really affordable and nice for hot summer heat as it uses the sun to heat up typically within 2 or 3 hours (that may sound like a long time, but if you have other things to do while it’s heating up, it’s not too much of an inconvenience). To use it, you can hang it from a tree branch or install a hook onto your camper van. It comes with a water temperature gauge. The water comes out slowly because it doesn’t have any pressure – it just uses gravity. This can be a little bit of a hassle for some, but it helps to conserve a lot of water. The shower head also has an on/off switch so gravity isn’t constantly forcing water through. Sounds weird, but they can really get the job done in times of desperation. It’s always good to have a pack of these in case of emergency. 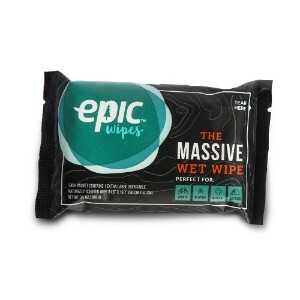 These Epic baby wipes are massive so they can easily clean your entire body. Planet Fitness is $10 per month, and they’re all over the U.S. Can’t hurt to get a quick workout in too! Some campsites have showers, so keep an eye for them. Don’t forget to bring your flip flops! Many beaches have showers for those who want to clean off after a dip in the lake or ocean. The Counchsufing app is typically used for people looking to find places to sleep, but I’m sure people won’t mind if you just use their shower. You’ll find that some truck stops have areas to shower. Some mountain biking trails have showers for riders to clean off their bikes. If they’re on the way to your next destination, use their place. 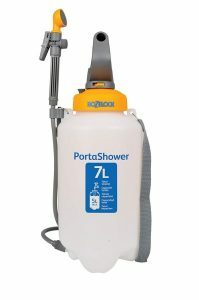 I wouldn’t go out and buy a weed sprayer because you can get a decent hand pump shower for the same price, but if you have one laying around your house, give it a try. Use gallon water jugs to wash yourself off. Use a wet cloth or sponge with a bucket of water. If you’re desperate, you can always go into a McDonalds bathroom and use the sink to rub some water under the stinky areas. If hair is the only thing you’re worried about, this is not a bad option. 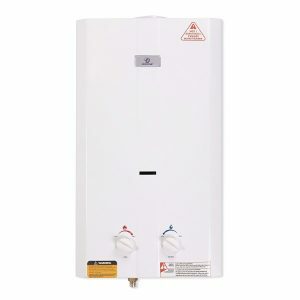 The Eccotemp L10 is one of the best portable water heaters on the market and is a really great option if you’re using your own water tank. It’s very easy to install and comes with all the necessary accessories for installation – you will need to buy a shower head, hoses, and pump separately. 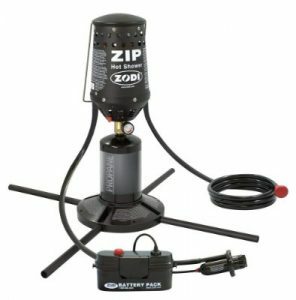 It connects to a standard propane tank to heat the water and is powered by batteries. It also has adjustable water pressure and temperature controls (ranging from 50 – 140 degrees F). This shower kit uses a small propane canister to heat the water. To use the shower, you submerge the battery powered pump into your water source and hit the pushbutton igniter to get it running. 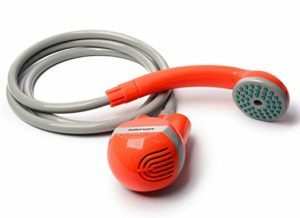 It includes a shower hose and head, along with the ability to adjust the water temperature up to 100 degrees Fahrenheit. This shower uses a foot pump to get the water running and the suns heat to warm up the water. This shower is great because it has adjustable water pressure and can pack up small when not in use. 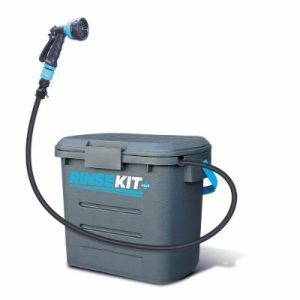 The RinseKit doesn’t use electricity, gas, batteries, or a pump – this is how it works: you fill up the shower kit container by connecting it to a hose spigot or sink from a house, in a campground, etc. It works by taking the pressure from the a spigot or sink and converting it into pressure you can use to power the shower. The shower head has an adjustable pressure setting – If you don’t have access to a sink or spigot, you can buy their Pressure Booster Hand Pump Accessory to power the shower instead. Capacity: 2 Gallons – will run about 1 minute 15 seconds when it’s in “shower mode”. Because nobody likes a peeping Tom. This can also be used to shelter yourself if you’re going potty. We talk more about going potty in nature in our Camper Van Toilets section below. Put this in a bucket or container to heat up your water – it will get a few gallons of water hot in just a few minutes. 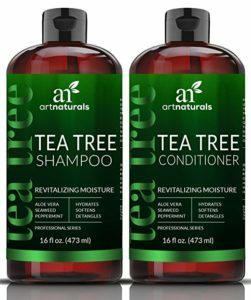 Use environmentally friendly shampoo and body wash, please! This shower design was given to us by our friends @three_vanlifers. To make this, you can use any sort of rope or cable along with metal hooks to hold up the shower curtain. 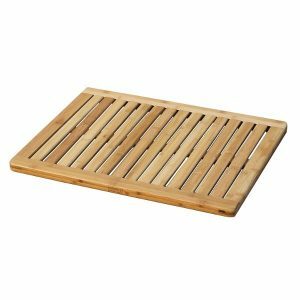 They also recommend getting something to stand on while showering, such as a wooden pallet. In the winter if you’re staying somewhere cold or if you’re in an urban area and you want your privacy, this is a good option. 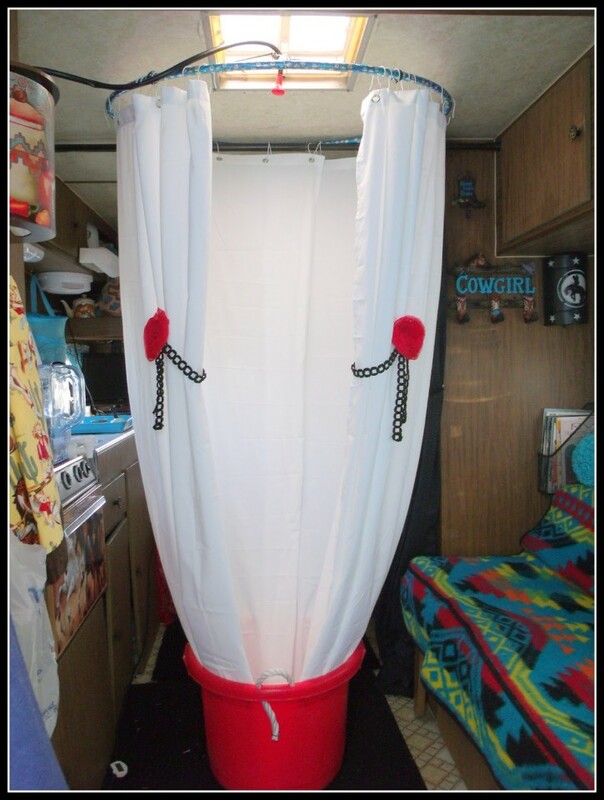 An easy way to do this without having to build an actual shower inside your conversion van is to take a bucket large enough to stand in, a hula hoop, a shower curtain with hooks and then figure out a way to temporarily attach it to your van’s ceiling. You could do this by attaching Velcro, installing small hooks, or as you can see in the picture below, they are lucky enough to have a pole that allows the hula hoop to slide over. 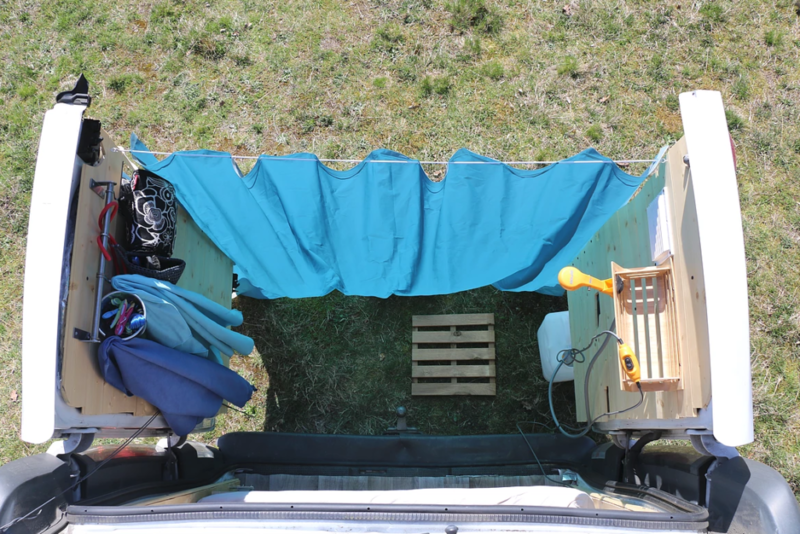 Using a toilet while living in a camper van isn’t always an enjoyable topic to discuss. But nobody is excused from these natural processes. We all have to go, so might as well talk, and share ideas about when nature calls. When it comes to going to the bathroom, the best thing you can do is plan ahead. You don’t want to get caught with your pants down, literally. You can park your van at night somewhere close to a public restroom for when you need it in the morning. Check out some of the public restroom ideas below. One method listed below is the use of a pee bottle, used by males, and females by way of the SHEWEE. If this method is for you, we recommend using a colored Nalgene bottle. 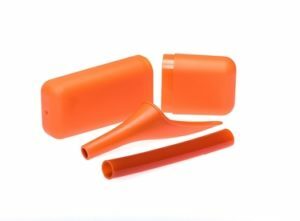 They have a wide mouth, never leak, are discreet because of the color, and are virtually indestructible. 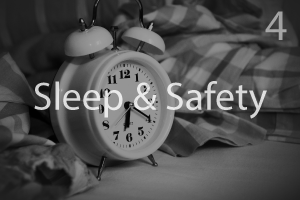 But once again, plan ahead, don’t get stuck in the middle of the night needing to go and you already have a full bottle! When it comes to going number 2, doing it inside the van is typically unnecessary. If you are boondocking or camping, there’s plenty of open space outside, and in the city. In the city, you will typically never be more than five minutes away from a public restroom. Gas stations are everywhere but can be unreliable. Grocery stores are great because you can pick up some fresh fruit and boom, two birds with one stone. If you do feel the need to go #2 inside the van, check out some of the van toilet options below. Every time you do your business, put a new bag(bio-degradable preferably!) around the rim just like as you would when putting a bag on a trash can. You’ll want to dispose of waste as soon as you can, but if you can’t get to a garbage for a brief while, you can leave the waste in the bucket – but be sure to tie the waste bag closed. I would also recommend adding some kitty litter or sawdust to the waste bag if you know you won’t be able to dispose of the waste for a while. You may think that it’s strange to be disposing your bodily waste into a garbage, but it’s perfectly normal – if you have a dog or baby you put their waste into a garbage. 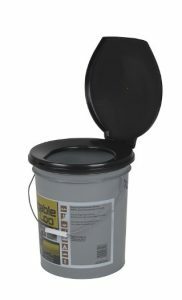 This portable toilet is simply a five gallon bucket with a toilet seat and sealable lid attached to it. The lid does a pretty good job at minimizing odors, and for the price, it’s a really great option. 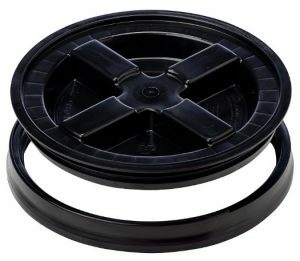 This lid will seal 5-gallon buckets very tightly, making them practically odor free. The seat also makes the bucket more comfortable to sit on, but not quite as comfortable as the Luggable Loo. Another option is to put some cheap pipe insulation around the rim to act as a seat. Campgrounds, fast food restaurants, etc. We recommend using the Flush toilet finder app. As soon as you open the app, it will display the nearest public toilets to you. It’s free, and you can even search for toilets without an internet connection. Grab a mini shovel and some biodegradable toilet paper and you’re good to go. 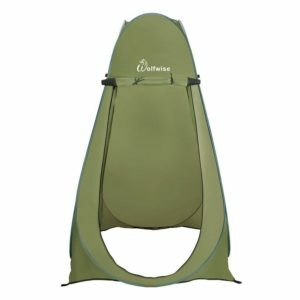 If you decide to go this route, you can shelter yourself with a pop-up shower tent like the one mentioned above in our Camper Van Shower section. This is great to have in case of emergency! This device allows women to stand while urinating, without removing clothing. It’s super handy to have in case of emergency when public restrooms are not an option. If your van conversion is completely DIY, it’s understandable if you want your toilet to be DIY as well. It’s a really cheap option, and looks and seems a bit more civilized compared to a bucket toilet. You can also design it to fit perfectly into a designated space in your van. The Cleanwaste Portable Toilet is similar to a bucket toilet in the sense that you will need to use bags to store your waste. 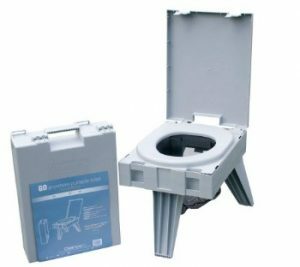 What really sets this toilet apart is it folds up really small so you can easily store it in your van. The downside is it’s not super affordable and definitely the least luxurious of the luxury options, but it’s very practical for those with very little space to spare in their van. Portable chemical toilets are great van life toilets because they’re very affordable, easy to use, you can go a few days without emptying them, and you won’t feel like a barbarian. The black/waste tank portion of the toilet is completely separate and it detaches when you need to empty it. This compartment has a strong seal so the smell is very minimal(except for when you have to empty them). To clean chemical toilets, you add a little bit of chemical solution and water to rinse it out. They’re also very lightweight and don’t require any installation so you can easily move it around your van when needed. To dispose of waste, you can use public bathrooms, porta pottys, or if you’re really off the grid for a while, you can dig a deep hole. The Camoco Standard Portable Travel Toilet is one of the best on the market and highly recommended. You can add up to 2.5 gallons of water to the fresh water tank. For it to function, you use the hand pump to add a little bit of water to the toilet before every time you flush. This model comes with bio-degradable chemical packets to clean the toilet. 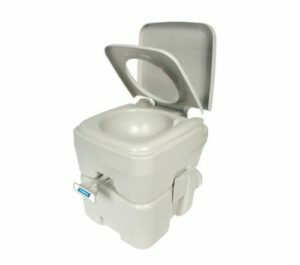 The Camco Premium travel toilet is a very similar option to the standard model. It’s a newer design but it’s features are almost identical. A nice new feature it has is the swivel dumping elbow which is an extended tube attached to the black water tank for waste to easily flow out of. Here is a short video from Camco that demonstrates how the toilet is used. 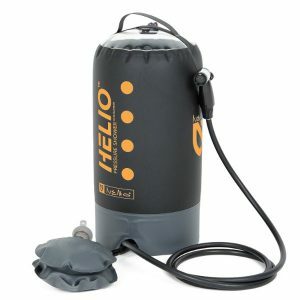 Has battery powered water dispenser instead of a pump such as the one seen on the Camco Toilet. This really isn’t a big deal but it will save you a second or two of pumping. Has 2 gauges. One that tells you how much waste is in your black water tank so you know when it’s getting too full and one that tells you how much water is in your fresh water tank. Comes with a side compartment for toilet paper. It has the ability to mount securely to the floor if you buy the necessary tools to do so. 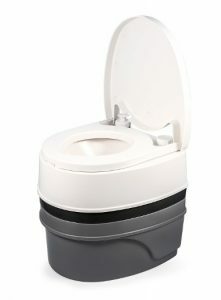 Along with the Camco Premium Toilet, the Thetford also has a swivel dumping elbow which makes dumping waste easier. Composting toilets don’t smell bad for a number of reasons. They have a separate compartment for solids and liquids and you will also want to use peat moss or something similar, which will almost completely remove the poopy smell. The toilet has a spindle on the side which is used to combine the peat moss with your poop to create the compost. Lastly, composting toilets use a hose and vent fan system which takes out all the moisture to reduce the smell. The downsides to composting toilets is they are expensive, and they need to be installed to 12v power for the fan(luckily it doesn’t take up much power) and a hole will need to be cut in your conversion van for the vent hose. This also means that once you install the toilet you can’t move it. 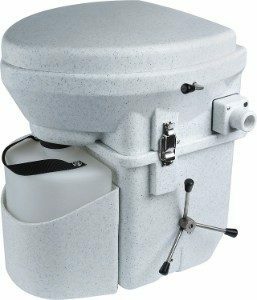 The Nature’s Head Composting Toilet is a great option for those with a bigger budget. It’s extremely durable, very easy to disassemble and remove waste, and comes with a hose and fan. Finding the best method to wash your clothes on the road can be tricky. There are several factors that can influence what method is right for you, including your budget, how much room you have available in your van, and where most of your time is spent while on the road. Listed below are a few great options. 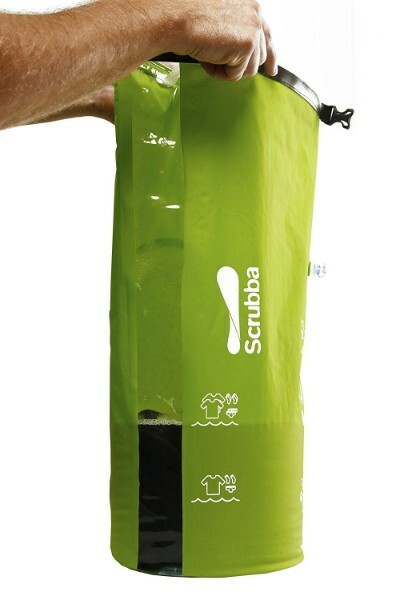 The Scrubba Bag – By far the most portable option, the Scrubba Bag is also an extremely affordable and effective method. While this option is a true off the grid method of washing your clothes, time is the one downside to this method as you do have to hang dry your clothes. 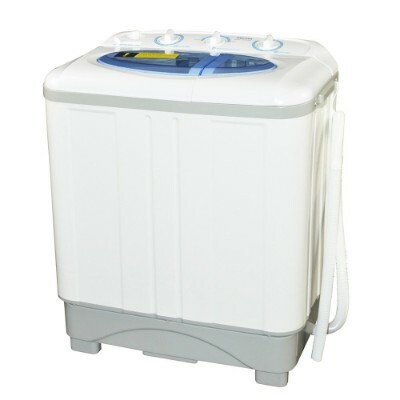 Panda Portable Washing Machine – If you have the money and the space, a portable washing machine is the best method. Highly effective and fast, this method is also off-grid friendly if you are running solar power. 5 Gallon Bucket – Old-school, cheap, and convenient. Wash your clothes wherever you have water. Again, since you must hang dry your clothing one downside to this method is time. Laundry Mat – If you happen to be in a town or campground with a laundry mat this can be a great option. 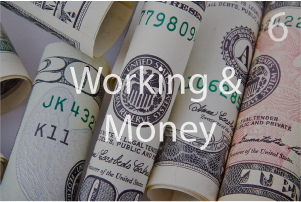 Two downsides to this method are the reoccurring costs and lack of convenience. River, Lake, or Pond – If you’re in nature and can find a relatively clean body of water this can be a great option to keep you one with nature. Hand Washing in a Sink – If worse comes to worse, you can stop by a rest stop, fast-food joint, or a gym if you have a membership.